"Guns R Us" by Jeanne Marie Laskas. "A Trip to the Threshing Floor" by Eli Saslow. "Horse Power" by Guy Martin. 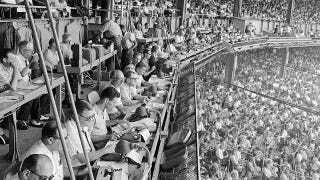 "No Chattering in the Press Box" by Bryan Curtis. "Born to Run Back" by Jennifer Kahn.